CHARLOTTE, N.C. (AP) Kemba Walker had that look in the fourth quarter. Charlotte coach Steve Clifford has seen it before, and he knows not to question it or argue with his point guard when he sees it. 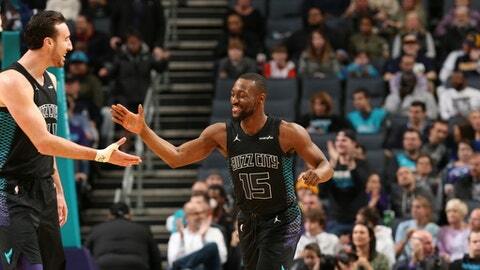 Walker played the entire fourth quarter, scoring 13 of his game-high 41 points in the final period as the Hornets rode a record-setting start to a 133-126 victory over the Indiana Pacers on Friday night. Walker made 11-of-22 attempts and helped fend off the Pacers’ final rally after they had whittled away at what had been an 18-point Charlotte lead. Cory Joseph’s free throws cut Indiana’s deficit to 128-124 with 40 seconds left, but Charlotte hit five free throws after that to ice it. Walker outdueled All-Star point guard Victor Oladipo, who led Indiana with 35 points, and helped the Hornets hang on after their fast start. Buoyed by 16 points from Nicolas Batum, the Hornets scored 49 points in the first, a franchise-best for a quarter. Charlotte connected on 7 of 11 from 3-point range and hit 19 of 23 from the field in that stretch. It marked the highest point total for an NBA team in any quarter this season. Charlotte led 49-37 after the first, as the Pacers came within a point of matching the most first-quarter points by a Hornets opponent this season. The Pacers outscored the Hornets 34-25 in the third quarter, led by 13 points from Oladipo, to narrow Charlotte’s advantage to 96-91. That’s when Walker went to work in the fourth. He hit 4 of 6 attempts and all four free throws in the final quarter. Four other Hornets players scored in double-digits, led by Batum’s 31 points and Dwight Howard’s 12 points and 11 rebounds. Charlotte won its second game in a row. Myles Turner added 19 points and 11 rebounds for Indiana. Pacers: Center Al Jefferson, who played for Charlotte 2013-16, received a loud ovation when he entered the game at the end of the second quarter. Hornets: The 49-point first bettered a 47-point fourth quarter Charlotte had on Dec. 4, 1991 against the Los Angeles Lakers. … Batum was 11-of-18 shooting. … C Cody Zeller returned to the lineup after missing 27 games because of left knee surgery to repair torn meniscus. The Hornets were 12-15 without Zeller in that stretch. Zeller totaled five points and three rebounds in 16 minutes. … Marvin Williams missed his second straight game with a left ankle sprain. Coach Steve Clifford said Williams is not expected to miss significant time. … Dwight Howard’s 11th consecutive double-double – the longest active streak in the NBA – was his 33rd of the season. Sure, Burke has been an NBA head coach before. Burke debuted as acting head coach for Indiana on Friday night as Nate McMillan sat out the one-game road trip for personal reasons. McMillan is expected to return to lead the team Saturday at home against Philadelphia. The 21-year Pacers coaching veteran usually focuses primarily on defense, so he had to adjust to calling a full game. After hitting five 3-pointers, Walker has 928 career 3-pointers – just one behind the Charlotte franchise mark of 929 by Dell Curry. Walker was hoping to break the record in front of his Charlotte fans, but the Hornets head for a four-game road trip beginning Sunday. Pacers: Back home Saturday to host Philadelphia for a quick two-game homestand. Hornets: Travel to Phoenix on Sunday for the first of a four-game West Coast road trip.